As business owner and a person that travels frequently for both business and leisure, I’ve always adopted good habits when it comes to traveling light and ensuring that my files are always backed up. If you don’t have a good back up strategy, you risk losing a lot of money, time or both at any time without much warning! The good news is that if you DON’T have a good file back-up strategy, you do have a lot of options today to set up one. From Cloud Computing to external hard drives and high-capacity USB drives, the possibilities are endless. I use a variety of back-up mechanisms depending on what is more convenient for each particular situation. Cloud back-ups are very useful when you need to reach any type of file or application from a remote location, whether you travel with or without your personal computer or laptop. Storage in the Cloud has become much more affordable lately and companies like Google, Amazon, Apple and many others, already offer a large amount of Cloud back up space free of charge. A portable external drive such as Western Digital’s “My Passport” is one of my favorite options for local storage though. 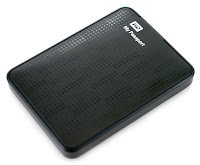 They are just about the size of a wallet, they can hold up to two Terabytes of files, and they are really fast too. You can also program them to perform automatic back-ups for you, the folders you want to back-up, etc. When I travel to a location at which I will have access to another work station, I typically just take “My Passport”, plug it in, and I’m good to go with all of my files available again. Of course, for smaller file back-up requirements, a simple USB drive will do it. I used to have a 6MB USB drive to store my Outlook Email file. Again, if you work from different work stations and you’re not using an Exchange server, having your Outlook (.pst) file with you is extremely useful. But above all else, if your computer crashes or is damaged for any reason, you will be much less worried if you have all of your files backed-up in multiple locations. I recently went through this experience myself when I traveled to Spain for Christmas. I took my laptop with me as I always do, it worked great all the time I was in Spain, but when I returned to the US, the hard drive had some damage and it would just crash all the time. Long story short, I ended up purchasing a new laptop, however, aside from the hassle of having to re-install a few pieces of software, I was able to restore all my backed-up files in no time, and that my friends is great piece of mind.